Identity fraud is always in the news. According to some sources it’s the UK’s fastest growing crime. But how does it really affect you? There are numerous types of identity fraud – more and more emerge every day. Identity criminals use their wits and ingenuity to stay one step ahead of the crowd. Personal information has been leaked via handheld card machines ATMs and company databases; it’s been stored on iPods, used to open fake bank accounts, and stolen to break speed limits. A good fraudster can make a million – and get away with it! But don’t panic. Security measures are put in place by your internet supplier, by your bank, and by the law to make sure that our privacy is protected in every way possible. However, there are many ways in which you can reduce your own risk. As the most common form of identity fraud, Credit Card Fraud is a crime which was estimated to cost the British economy £110m last year. The perpetrator uses your card details to make purchases without your consent. It can be carried out over the telephone, by mail, fax, or online. Do you know anyone who has been a victim? It can be a real shock to discover that your account is being used in another part of the country, to buy things you’d probably never even wanted. Fortunately, banks and lenders are very conscious of this type of fraud. In many cases they will spot the discrepancy before you see a statement. But you should still take steps to protect yourself against this type of fraud. Check ATM machines for any suspicious attachments, and run your hand beneath the top ledge to check for gadgets. Keep your cards within sight at all times. Check your statements regularly for unusual transactions, and call your bank about anything you don’t recognise. Keep your PIN in one place – your head. Don’t write it down or disclose it to anyone, especially not over the internet. Make sure that you shred or burn bank statements and receipts. Sign up with Visa Verified or Mastercard Secure Code, which add extra security for online shopping. This type of identity fraud could be carried out behind your back – and you might never find out. It involves the use of your identity (name, address, birthdate and so on) to open a bank account, borrow money, or leave the country. Renowned fraudsters have stolen identities from the living and the deceased in order to create cover personas for criminal activity. Innocent people have been taken to court to prove that someone else is operating under their name. It’s a truly frightening crime, and costs upwards of £10,000 to recover from. So how do you know when you become a victim of this type of crime? If any of the following happen, take steps to investigate: Unusual or unexpected post addressed to you; post addressed to deceased family members; an absence of post arriving at your home (particularly bank statements, which can be intercepted); refusal on a credit application; loss of a passport or driving licence. Request your credit file using a reference agency. It will contain details of any account or loan applications made by you. If your mail disappears, call the Royal Mail and ask if a redirection has been set up. Keep your personal information safe and locked away. Make sure you know the whereabouts of important documents like passport and driving licence. Shred all personal documents that you don’t need to keep. Scams are wide-ranging in their scope, and often very imaginative. If you’ve ever had an email about the Dutch Lottery, or you’ve been asked to correct your security details using an unknown website, then you’ve been a target. Fortunately most scam emails are fairly transparent and you’re likely to delete them immediately! But scammers don’t stop there. You could also be targeted by post, in person, or on the telephone. The important thing is to keep your wits about you. Sign up with the Mail Preference Service and the Telephone Preference Service. Be wary of telephone calls from strangers. If someone is offering you a free prize or holiday, it’s too good to be true. Never reveal personal information, via a website or over the telephone. Anyone claiming to be calling from your bank or other organisation should already know your personal information. If in doubt about the authenticity of any phone call, ask if you can hang up, obtain the correct number from a website or directory, and call back. There are lots of things that you can – and should – consider doing. 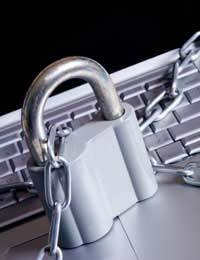 Read our articles on protecting your computer, your online privacy, your financial details, and your home privacy. Take the actions recommended, and keep your eyes open.